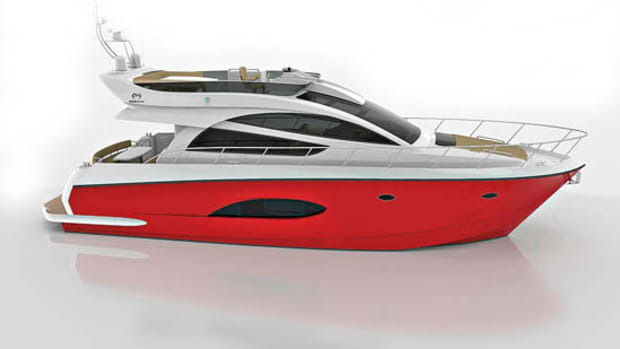 Don&apos;t be misled by the sleek, swept-back lines of her sporty profile; the Horizon 95 delivers interior space on a grand scale wrapped in a lithe, well-proportioned exterior. 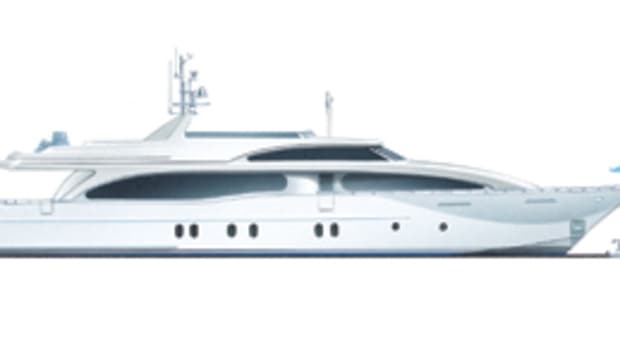 Foregoing the utility of full walkaround side decks, this yacht&apos;s owners opted for a wide-body saloon that extends full beam along the length of the deckhouse, giving the interior an extraordinarily spacious feeling. 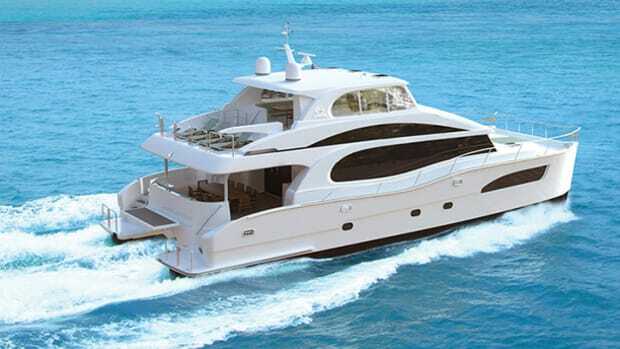 Complementing her generous saloon and formal dining area, she accommodates six or more for alfresco meals on her aft deck and a like number in her expansive country-kitchen galley forward. The wide-body sensation extends to the flying bridge, which boasts a wet bar with four stools opposite a dinette that can seat eight or more. 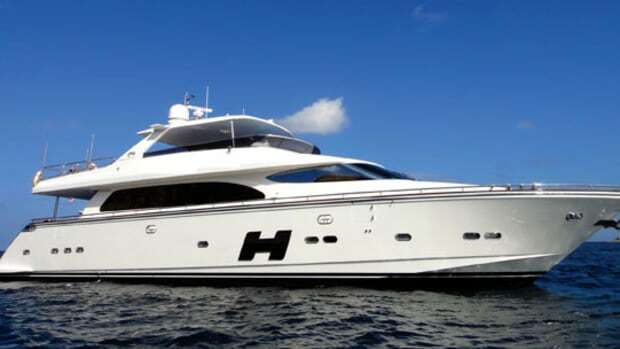 Aft, there is room for a large hot tub and a RIB, while forward there are sunpads and guest seats on the starboard side opposite a helm station. A partial hardtop provides shade for everyone seated at the wet bar and dinette yet allows guests to enjoy full sun while lounging in the hot tub or relaxing on the sunpads. Stairways fore and aft on the flying bridge let the crew move easily and quickly between the bow and stern without intruding on the yacht&apos;s interior spaces. 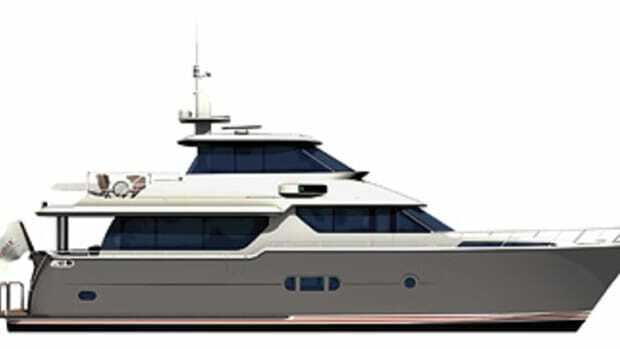 The lower-deck layout of this raised-pilothouse design seems suggestive of a less-is-more philosophy: Rather than shoehorning four or more guest staterooms into the space, there are just three. 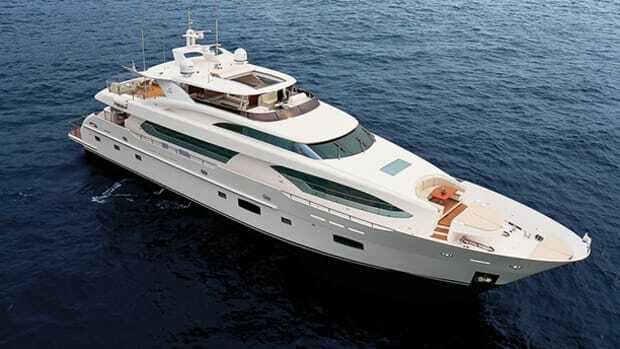 The master suite boasts genuinely impressive proportions—it&apos;s full-beam amidships with a his and her head buffering the sleeping area from the engine room. To starboard there&apos;s an oversize dressing table, while on the port side there is a big L-shape settee. The VIP suite in the bow is only slightly smaller than the master, and a third generously proportioned stateroom to port also has en suite facilities. 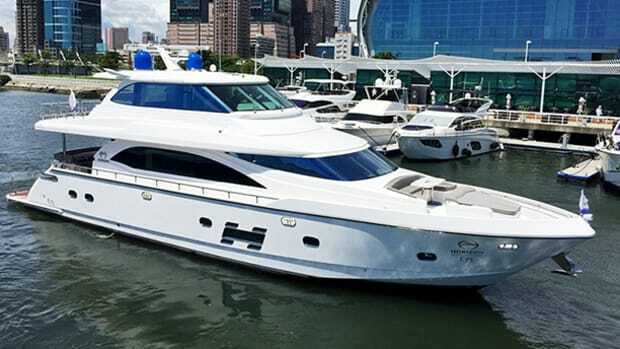 To ensure comfort underway, her hard-chine hull form should provide good roll damping. 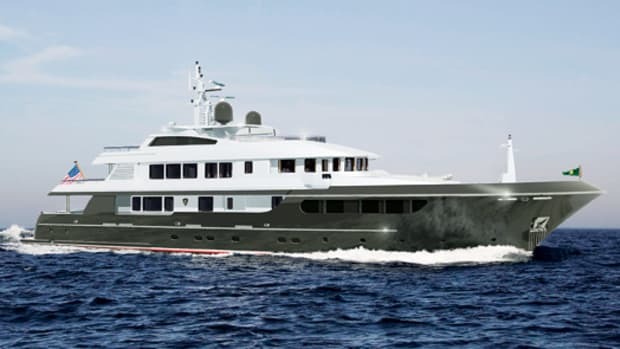 Fine bow sections assure a smooth entry in heavy seas, while generous freeboard promises to keep her decks dry. 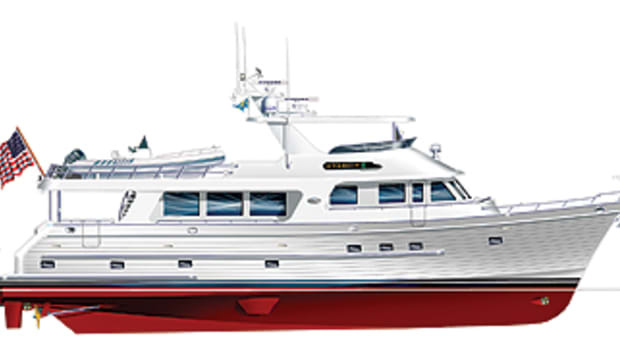 Propeller pockets keep her full-load draft at just a hair over six feet, and a sold-laminate hull bottom offers a reassuring sense of toughness. The combination of cored hull sides and resin-infusion using the SCRIMP construction method should result in optimum strength with minimum weight.